Pastor Adeboye of the Redeemed Christian Church of God has denied media reports that he called Bola Tinubu to beg for Governor Ambode. 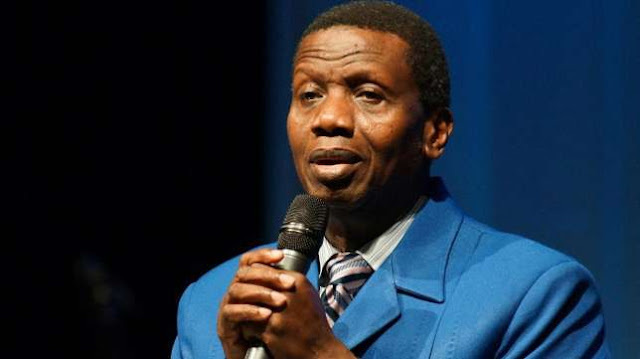 General Overseer of the Redeemed Christian Church of God (RCCG), Pastor Enoch Adeboye, has denied putting a phone call across to APC godfather Bola Tinubu on behalf of Governor Akinwunmi Ambode of Lagos. Ambode has fallen out with Tinubu and the APC godfather has settled for 53-year-old Babajide Sanwoolu to end Ambode’s bid for a second term in office. But the preacher says he never rang Tinubu to discuss Ambode’s travails. “We would like to inform the general public that this is false and Pastor E.A Adeboye has not and would not be involved in inter/intra party politics in Nigeria and anywhere RCCG is present across the world. Pastor E.A Adeboye advises all well-meaning Nigerians just like him to get their PVCs and exercise their civic duty. “God bless the Federal Republic of Nigeria." Pastor Adeboye is notable friends with the Tinubus. He’s also on first name basis with a handful of politicians in the power corridors. Vice President Yemi Osinbajo is a serving Pastor of the RCCG. In August, Adeboye’s RCCG ordained Senator Oluremi Tinubu an Assistant Pastor. The ordination took place during the ministry’s 66th annual convention.